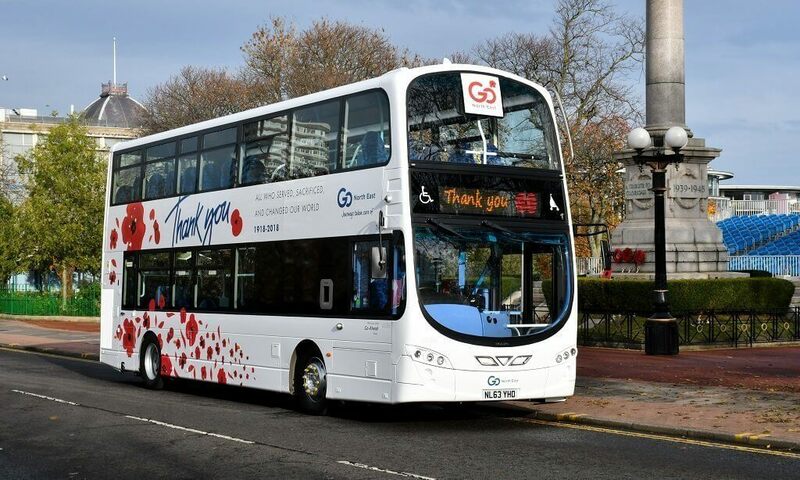 Go North East introduced a number of poppy-themed features across its services on the lead up to Remembrance Day. This year’s commemorative vehicle of choice, a Volvo B9TL/Wright Eclipse Gemini 2, is the latest in a long line of poppy buses from the operator; it was the first to launch a dedicated poppy vehicle over a decade ago. Tickets issued onboard replicate the same wording, and utilise the social media hashtag #thankyou100. Stephen King, Commercial Director at Go North East, explained: “In this centenary year, we wanted to go one step further in honouring those service people who died valiantly in battle, particularly as we have a high proportion of team members who are ex-military. 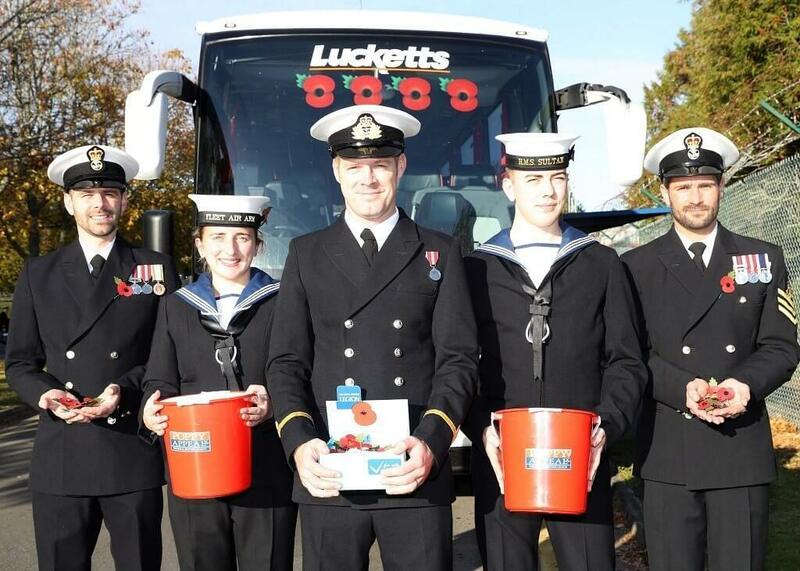 Well-known Hampshire operator Lucketts Travel showed its support for the UK armed forces by transporting almost 100 military volunteers to London Poppy Day. 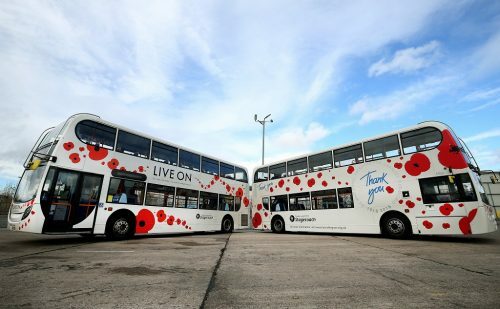 The company also emblazoned its vehicles with poppies in support of Remembrance Day. The firm transported crew from HMS Sultan, the on-shore base of the Royal Navy in Gosport, to take part in The Royal British Legion’s London Poppy Day on 1 November. The event is the largest one-day street collecting event of its kind and sees veterans, serving forces personnel, civilians and celebrities raise money for the charity by selling poppies in the capital. More than 2,000 collectors take to the streets for the event and major train stations across London also host music from top military bands. Lucketts provided three coaches for the event, meaning the servicemen and women could easily get to the capital and raise money for The Royal British Legion by volunteering on the day. They helped to raise thousands of pounds towards the day’s overall target of more than £1m. Lucketts’ Managing Director Tony Lawman said of the project: “The dedication of those at HMS Sultan is to be commended and it was our pleasure to help the team get to London. A number of Stagecoach bus companies decorated their buses with special designs to commemorate 100 years since the end of World War One. The charity raises funds for those who have hidden wounds from war, and educates all generations about why they made the sacrifice. 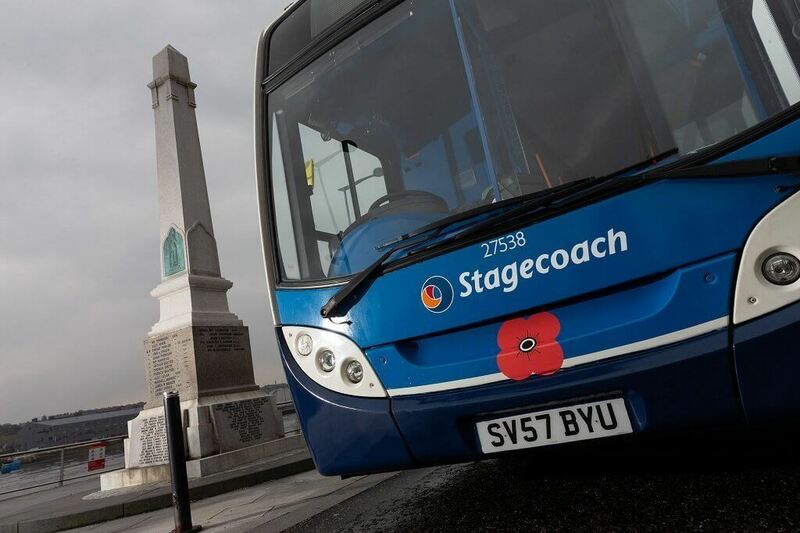 Stagecoach in Merseyside, Cheshire and South Lancashire also placed a poppy on each of its 400 buses across the region, and over 100 buses in North Scotland wore poppies. Stagecoach South East also designed a special poppy wrap for one of its double-decker buses. As part of the Royal British Legion’s official launch of the Poppy Appeal in Kent, veterans and members gathered at the bus station in Canterbury where they welcomed Kent’s first Poppy Bus. In addition, megabus.com mascot Sid wore a poppy on the side of coaches travelling across England, Scotland and Wales during the 2018 poppy appeal.